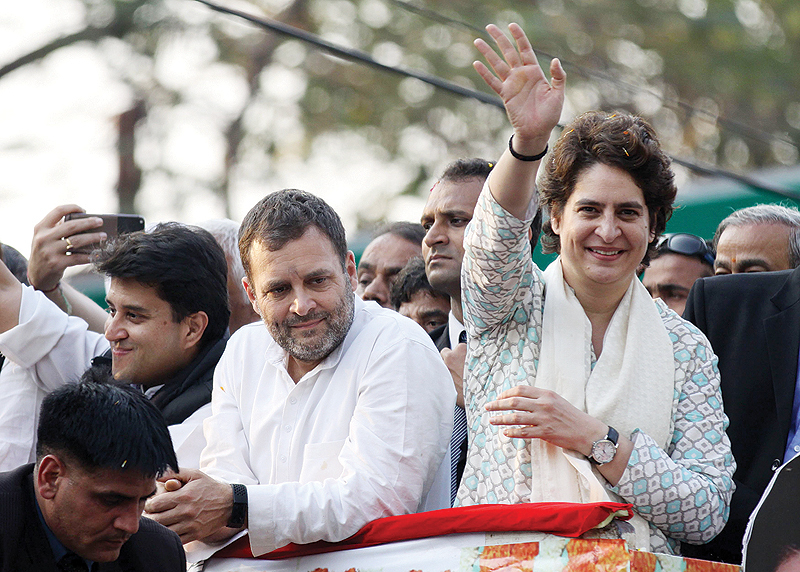 LUCKNOW: India’s powerful Nehru-Gandhi dynasty yesterday unleashed its newest star with thousands turning out to see Priyanka Gandhi Vadra speak at her first rally as the country gears up for a general election. Crowds showered rose petals on the great-granddaughter of India’s founding leader Jawaharlal Nehru as she took an open bus tour through Lucknow, capital of the key northern state of Uttar Pradesh. The opposition Congress party is counting on the 47-year-old daughter of assassinated premier Rajiv Gandhi to boost its campaign against nationalist Hindu Prime Minister Narendra Modi who is expected to call an election in April. Priyanka and elder brother Rahul Gandhi, the Congress president, waved at cheering supporters who chanted their names while dancing to drums. Many wore pink t-shirts emblazoned with her picture. At a rally she called for supporters to join a campaign to build “a new future” for India and a “new kind of politics where everyone is a stakeholder”. The Nehru-Gandhi family has dominated Indian politics since independence in 1947 but Priyanka had for years resisted calls to enter the political fray. This ended last month when she accepted a key party post. Priyanka opened a Twitter account yesterday and drew more than 85,000 followers in hours. Congress, tainted by scandal, was obliterated in the 2014 polls by Modi’s Bharatiya Janata Party, is banking on “Priyanka magic” to win votes. It especially needs a breakthrough in Uttar Pradesh where the BJP won 71 of the state’s 80 seats in 2014. Analysts say Modi faces a tougher fight this time from Congress which won a clutch of state polls in late 2018, tapping into discontent over the lack of new jobs and farm debt. The prime minister has repeatedly called on voters to shrug off “family rule” which he says has ruined India.